For a band who helped draw up the prog-rock blueprint, The Nice had unlikely beginnings. The four- piece formed in London in 1967 as a backing band for soul belter PP Arnold. But by the end of that year they had parted company with Arnold and released their own psychedelia-tinged debut album The Thoughts Of Emerlist Davjack. If their origins as a band were unusual, then the song with which they made their name was outrageous. Released in June 1968, America would crystallise the burgeoning prog-rock movement, and turn The Nice into one of the most controversial bands of the day. The song, written by Leonard Bernstein, started life in the Broadway musical West Side Story. In this incarnation it was a celebration of the American way of life, sung by an immigrant character. It was one of the most shocking events of the late 60s that persuaded them to record the song in its own right. The band – completed by guitarist Davy O’List and drummer Brian Davison – were driving back from a gig on the Isle of Wight in June 1968 when they heard the news that US Senator Robert Kennedy, the brother of murdered President John F. Kennedy, had been shot and killed while campaigning for the Democratic presidential nomination. It was the era of the protest song. Against a backdrop of civil rights struggles, student unrest and the war in Vietnam, the likes of Bob Dylan and Phil Ochs were channelling the mood of the times in their lyrics. But, in a novel approach, The Nice decided to turn America into what Emerson calls “the first protest instrumental”. Recording at London’s Olympic Studios, they flipped the song on its head. 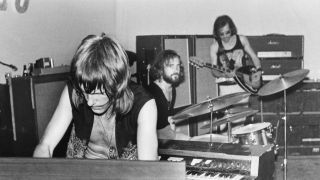 Its Broadway tempo was replaced by an angry, powerhouse momentum, with Emerson’s aggressive keyboards leading from the front. Most importantly, the song’s original lyrics were stripped away. Jackson controversially added a single spoken-word line at the end to hammer home the song’s bitter irony. Released as a single on June 21, 1968 America began picking up radio airplay thanks to a few DJs who grasped what the band were trying to do, though at six-and-a-half minutes it was too long for Top Of The Pops. “They wanted us to lose about 90 seconds,” Jackson says. “We refused.” But it was a controversial incident at the Royal Albert Hall that propelled the song into the UK Top 30 – and to notoriety. The Nice had been booked to play an anti-apartheid concert at the prestigious London venue on July 7, part of a bizarre line-up that included Sammy Davis Jr, British jazz stars Johnny Dankworth and Cleo Laine, and the cast of TV comedy series Till Death Us Do Part. The band were quickly ushered off stage. Driving home, they found out via Radio Luxembourg that they’d been banned for life from the Albert Hall. More than 40 years on, The Nice’s version of America remains one of the iconic musical moments of the 60s. As Emerson says, it also stands as a timeless reminder that some things never change.